Pope Francis called for peace in Jerusalem in his traditional Christmas address, warning: 'The winds of war are blowing,' as he called on Israel and Palestine to 'resume' dialogue. The pontiff urged the world's 1.3 billion Catholics to not to ignore migrants fleeing danger, highlighting the plight of children scarred by the conflict, in a yuletide message of unity. 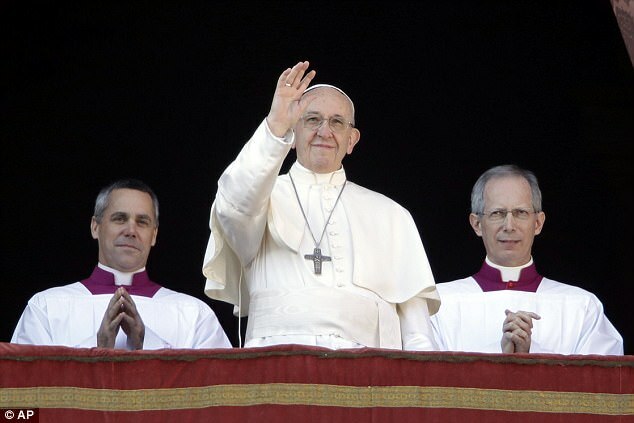 Addressing tens of thousands of worshippers gathered at the Vatican to hear his fifth 'Urbi et Orbi' (To the City and The World) message, Francis called for 'peace for Jerusalem and for all the Holy Land. 'We see Jesus in the children of the Middle East who continue to suffer because of growing tensions between Israelis and Palestinians,' he said. The pontiff's plea came as fresh tensions simmered in the West Bank following President Donald Trump's recognition of Jerusalem as Israel's capital. Following Trump's lead, Guatemala's President Jimmy Morales said Sunday his country would move its embassy from Tel Aviv to Jerusalem. 'May the Lord also sustain the efforts of all those in the international community inspired by good will to help that afflicted land to find, despite grave obstacles the harmony, justice and security that it has long awaited,' the pope said. The pontiff also mentioned other global flashpoints such as Syria, Iraq, Yemen, South Sudan and Venezuela, after stressing that the 'winds of war are blowing in our world'. 'Let us pray that confrontation may be overcome on the Korean peninsula and that mutual trust may increase in the interest of the world as a whole,' the 81-year-old said. 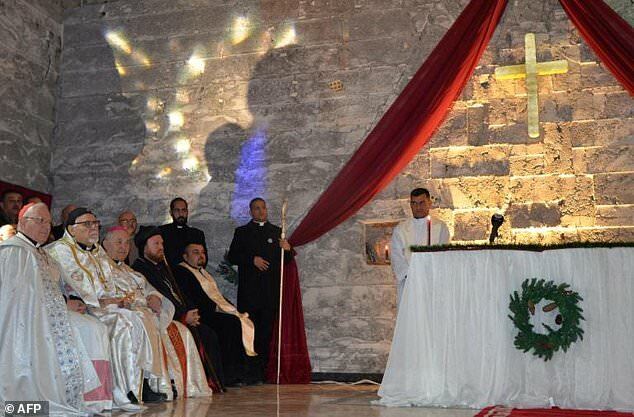 Earlier, celebrating midnight mass in the ancient town, Archbishop Pierbattista Pizzaballa, apostolic administrator of the Latin Patriarch of Jerusalem, used his homily to lambast the wars that 'the Herods of today fight every day to become greater, to occupy more space'. Criticising Trump's announcement, Pizzaballa insisted 'Jerusalem is a city of peace, there is not peace if someone is excluded. Jerusalem should include, not exclude,' stressing the principle that Jerusalem is a city for both peoples and the three Abrahamic faiths. Twelve Palestinians have been killed since Trump's declaration, including a 19-year-old who died of his wounds on Sunday nine days after he was shot during a Gaza protest. Israel seized east Jerusalem in the 1967 Middle East war and later annexed it, in moves never recognised by the international community. In the central Syrian city of Homs, Christians will celebrate Christmas with great fanfare for the first time in years after the end of battles between regime and rebel forces -- with processions, shows for children and even decorations among the ruins. 'This Christmas, I think of London and Manchester, whose powerful identities shone through over the past 12 months in the face of appalling attacks,' the 91-year-old monarch was to say in the pre-recorded televised message. London suffered two deadly terror attacks, while 22 people -- including children -- were killed during an attack at Manchester Arena following a performance by US singer Ariana Grande. Meanwhile, he likened the journey of Mary and Joseph to Bethlehem to the migrations of millions of people today who are forced to leave their homelands for a better life. 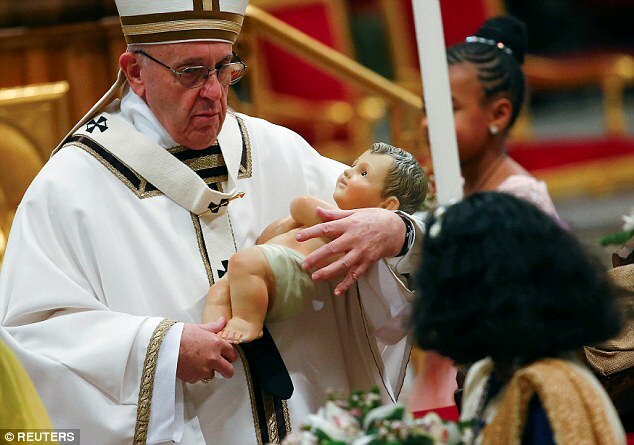 During the Christmas Eve vigil Mass in the Vatican, the Pope told the faithful that the 'simple story' of Jesus' birth in a manger changed 'our history forever'. Noting that Mary and Joseph arrived in a land 'where there was no place for them', the pontiff drew parallels to contemporary time. 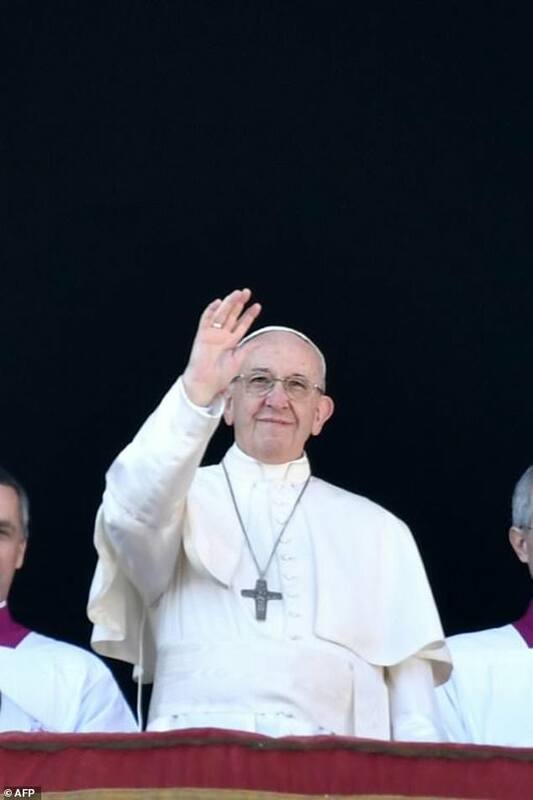 'In many cases this departure is filled with hope, hope for the future; yet for many this departure can only have one name: survival,' the pope said. Referring to the king of Judea who was depicted as a tyrant in the New Testament, Francis continued, saying some migrants are 'surviving the Herods of today, who, to impose their power and increase their wealth, see no problem in shedding innocent blood'. He said God is present in 'the unwelcomed visitor, often unrecognisable, who walks through our cities and our neighborhoods, who travels on our buses and knocks on our door'. That perception of God should develop into 'new forms of relationship, in which none have to feel that there is no room for them on this Earth,' he said. 'Christmas is a time for turning the power of fear into the power of charity,' Francis said. At the start of the service, Francis bent over to kiss a statue of the baby Jesus in the basilica. At midday on Monday, tradition calls for Francis to deliver the Christmas Day message 'urbi et orbi' – Latin for 'to the city and to the world' – from the central loggia of the basilica overlooking St Peter's Square. The speech often is a review of the world events and conflicts.